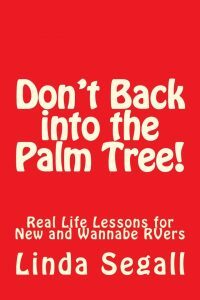 Purchase – Don't Back into the Palm Tree! If you are thinking about buying a recreational vehicle, make a small investment in Don’t Back into the Palm Tree! Real Life Lessons for New and Wannabe RVers, to help assure that you have adventures–not (mis)adventures. Don’t Back into the Palm Tree! is available for purchase as an e-book (for Kindle or Kindle app) or paperback at Amazon.com.